Concerts: Riverside, Edinburgh Liquid Rooms, 19th May 2017 - Sea of Tranquility - The Web Destination for Progressive Music! It's hugely uplifting to be able to say that after witnessing the return of Riverside, this band's future looks extremely bright indeed. Not long ago that statement would have seemed unlikely in the extreme, but with a sense of reverence and respect for their past, the core trio of Riverside are undoubtedly beginning to look to what comes next. In the meantime they astounded a packed Liquid Rooms in Edinburgh, Scotland, with the type of performance that will not only live long in the memory, but also in the hearts of everyone who witnessed it. Sea of Tranquility's Steven Reid was one of those lucky enough to be in attendance. Let's not dwell on the past, but it would be no exaggeration to suggest that after the tragic, sudden death of guitarist Piotr Grudziński in February of last year, if Riverside had decided to call it a day, then no one could really have blamed them. 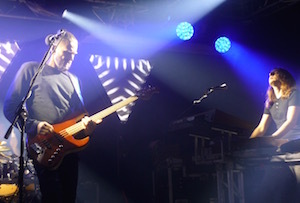 However an excellent, if different, album appeared in October of 2016 to confirm that the band would continue and do so with a proud determination. They also announced that they wouldn't be bringing in a permanent new guitarist, instead asking friends to help out on tour, with bassist and singer Mariusz Duda adding guitar in the studio. 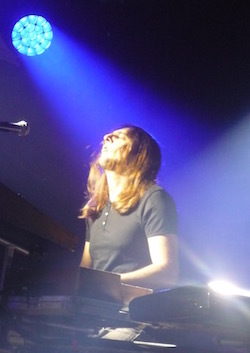 For this set of dates, dubbed the Towards The Blue Horizon Tour, Maciej Meller has taken on the role, something the band confirm he's done with a real sense of modesty and humility. Although it's only fair to add that he also brings a huge amount of talent as well. With no support act, the Riverside track, "Eye Of The Soundscape" filled that space rather beautifully, setting the scene and tone of the evening as one to celebrate both what has been before and what is yet to come. Only the core trio of Duda, keyboard player Michal Łapaj and drummer Piotr Kozieradzki entered the stage for a slow, mournful, "Coda", Meller joining them silently as the music began to grow and grow. Already the faithful crowd were urging the band on and showing their dedication and support to the Riverside cause, a forceful run through of "Second Life Syndrome" proving exquisitely jaw dropping. Duda then shushed the crowd and explained that while tonight was indeed about celebrating lost friends, it was also to be a cathartic experience and one to hopefully leave is with joy and hope in our hearts. Going on to say that right now, we certainly need all of those things right across the world. Whilst respectfully happy to stay - at least visibly - in the background, Meller's guitar work led from the front, intertwining with Duda's bass and dancing keenly across Łapaj's washes of keyboards to quite astounding effect. 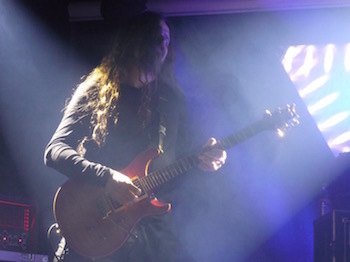 With a tone that's ever so slightly more forceful than Riverside have used before, the guitarist's introduction does alter the band's attack, while somehow keeping it exactly the same. Rolling through the ebb and flow of "Conceiving You" and "Caterpillar And The Barbed Wire", the emotions in both the music and performance visibly came to the fore, although it was during an extended version of "The Depth Of Self-Delusion", where the four-piece really began to stretch their sound further and further, causing the atmosphere to become quite charged and raw. An acoustic rendition of "Lost (Why Should I Be Frightened By A Hat?)" proved a masterstroke, altering the mood and tone of the performance, before fan favourites "02 Panic Room", "Saturate Me" and "Escalator Shine" constructed huge walls of melodic, seductive sound; "Before" a mighty set closer that saw the band cheered like heroes from the stage. 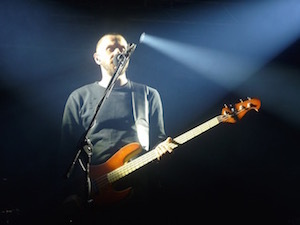 Dedicating the song that's given the tour its name to their fallen band mate, "Towards The Blue Horizon" opened the encores with hardly a dry eye in the house, the band visibly moved and emotional, though the same could be said for an unusually attentive audience. Closing the set as the show had begun, "Coda" was given a second airing of the night, although as Mariusz explained, this time in a much more uplifting, optimistic arrangement. As the song ended, the band's frontman asked for quiet, one final respectful moment to pay respects observed beautifully, before a mighty roar came from the crowd in celebration. Fittingly, as the lights rose, Riverside's "Where The River Flows" began to trickle from the PA speakers, the audience stepping out into the night knowing they had been part of an experience they'll never forget. Majestic, magnificent, moving and hugely memorable, Riverside, as they always have been, remain one of Progressive Rock's most enigmatic, energetic and mesmerising proponents. On the strength of this performance, that's long set to continue.